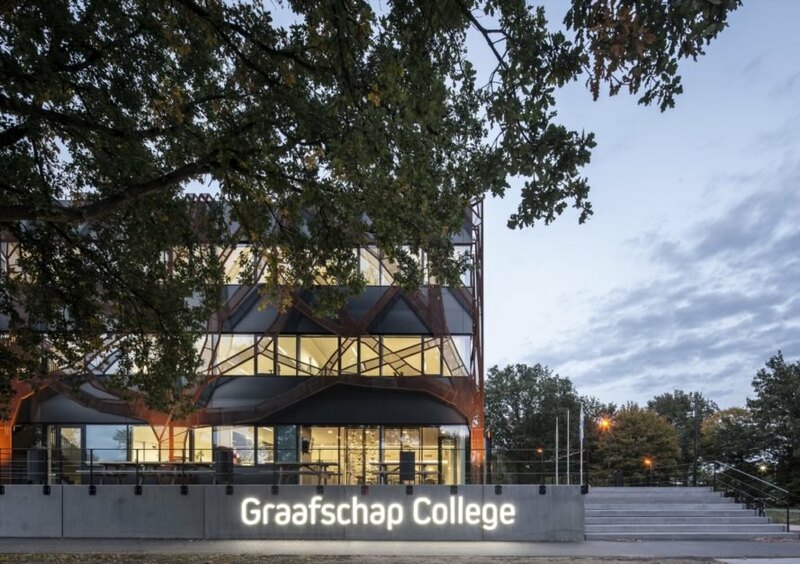 Delft-based architectural office cepezed recently completed a solar-powered branch for Graafschap College in Doetinchem that — unlike most school buildings in the Netherlands — eschews natural gas in favor of a power supply that’s 100 percent electric. 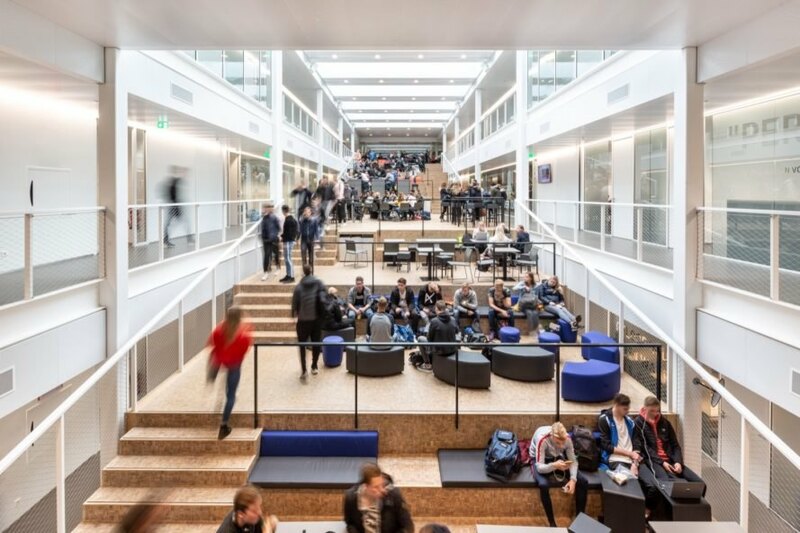 Built for the students of the Sports & Exercise and Safety & Craftsmanship departments, the new school building prioritizes a healthy indoor learning environment that maximizes access to natural daylight and views of the outdoors. In homage of the many oak trees that grow around the building, the architects partially wrapped the structure in tree-shaped weathered steel cladding that serves as a double skin for solar shading. 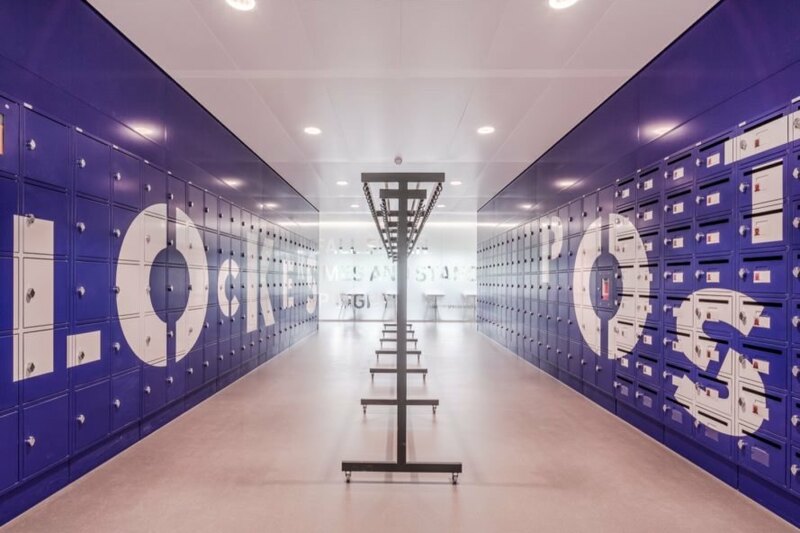 Built to house approximately 700 students, the new Graafschap College branch at Sportpark Zuid features at its heart a large, light-filled atrium named The Midfield in reference to sports and teamwork. The Midfield is organized into a series of cascading terraces with large landing areas that serve as informal meeting spaces. The glass atrium roof floods The Midfield with natural light and is combined with sensor-enabled LED lighting to reduce reliance on artificial lighting. For the facade, the architects installed alternating strips of glass and black aluminum panels to create a sleek and modern appearance. 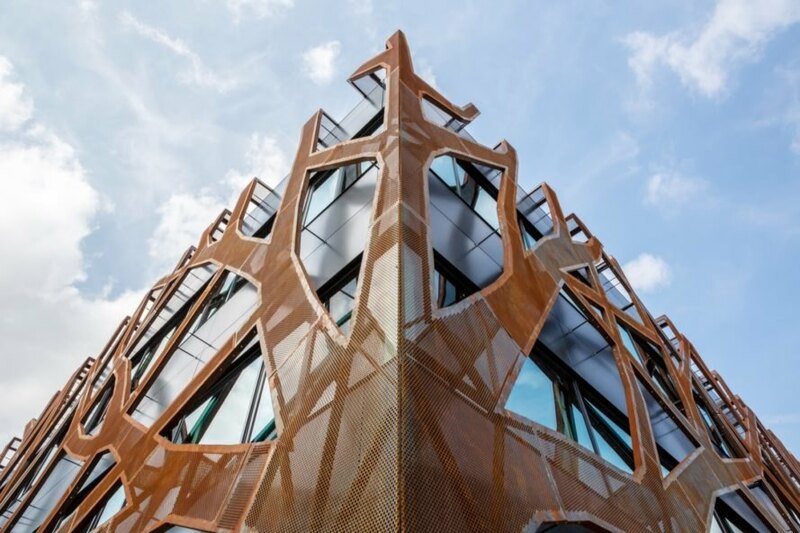 A second skin of perforated Corten steel cut into the shapes of oak trees is laid over the east, west and south facades of the building and helps deflect unwanted solar gain without preventing daylight from entering the building. 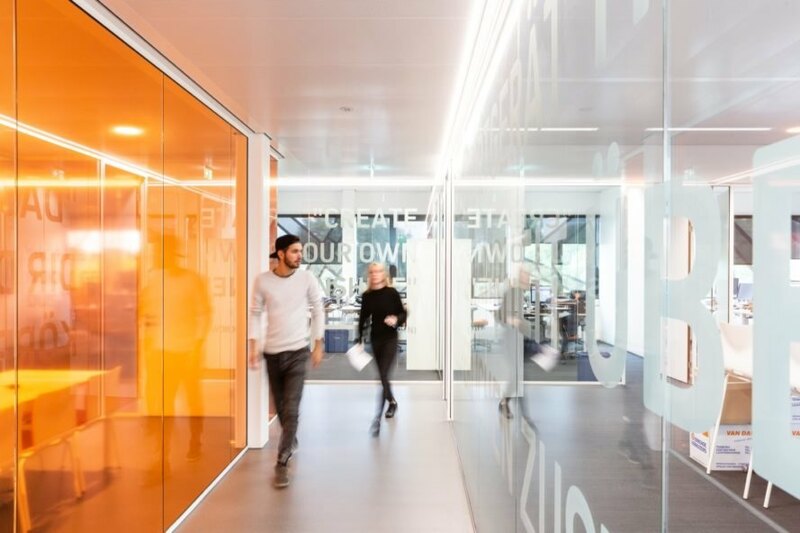 cepezedinterieur handled the interior design, which also follows a contemporary aesthetic but with brighter colors and patterns that allude to sports and movement. In addition to solar panels, the school also uses solar boilers for water heating. This is a great idea. Schools and other public buildings have a lot of space to use solar panels and can potentially get 100% of their energy consumption from sun. I hope we'll see more of these used going forward. This college building in Doetinchem is protected by massive weathered steel trees. Instead of natural gas, the school is powered by clean electricity. 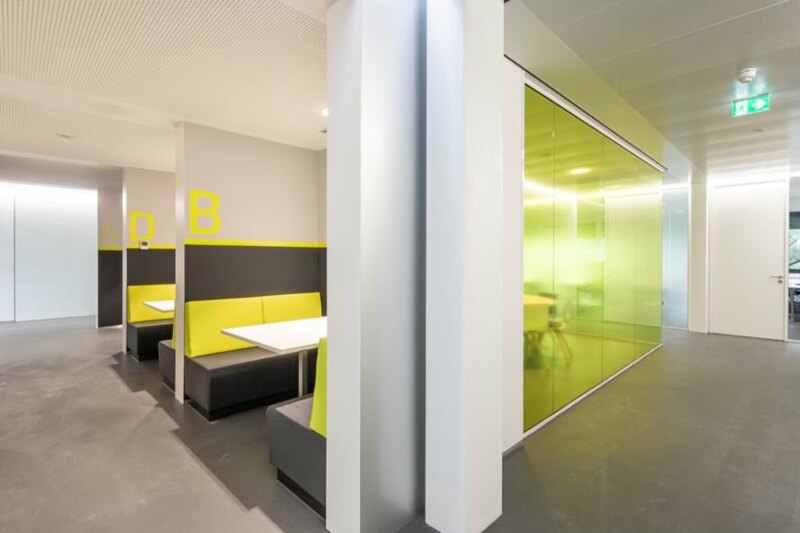 Inside, the school is bright and modern. Landing spaces double as lounge and study areas. Sensor LED lights keep energy usage to a minimum. Many of the building areas are minimalist. But bright colors are interspersed throughout. The bold colors reference sports and movement. The new college branch serves about 700 students. The unique weathered steel trees over the building facade reference the local oak trees and protect the structure from unwanted solar gain.